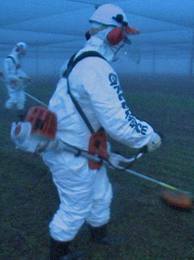 On July 14, Greenpeace activists in full biohazard gear, broke into a CSIRO research facility in Canberra and destroyed a genetically modified wheat crop. They claimed it was to be used in “the world’s first human feeding trials of GM wheat, without adequate safety testing.” The CSIRO and the Office of the Gene Technology Regulator said there was no significant risk to human health. The CSIRO pointed out that humans have been modifying plants for thousands of years via plant breeding. They said the intention of the experiment was to produce a grain that would contribute to greater dietary fibre intake, improving its nutritional qualities. It was to be fed initially to rats and pigs, with human trials to follow for the purpose of assessing the safety of the product. Genetically modified foods had already been on sale in several countries, notably the United States, for more than a decade with no confirmed cases of harm to the people who ate them. Some downsides to genetically modified foods have been identified, however. The modification of crops to resist herbicides and pest control sprays has led to increased use of these substances. While there’s no evidence of increased chemical residue in food crops, some pests and weeds are now becoming resistant to the controls. In addition, the proprietary rights asserted by companies that have developed GM seeds have led to conflict with farmers whose properties have inadvertently become contaminated with those crops. The two women who conducted the CSIRO raid had convictions recorded against them and were each given a nine month suspended sentence. It was claimed at the trial that the protest stemmed from a CSIRO’s refusal to release documents under Freedom of Information laws, saying they were commercial-in-confidence.